One of the most common causes of failure is the habit of quitting when one is overtaken by temporary defeat. Failure, what a strong word. We all have a fear of failure on some level. Some of us push past it or do our best to overcome it. Then there’s the actual dealing with it part that can be difficult to handle. The truth is that we will deal with failure on some level, on a regular basis when we are actively living as it is just another part of life. So how do we deal with it? As a tool we can use it to our advantage and as a lesson we can learn from it. We will be better for this new experience. We adjust, changing our method in order to try again. We can even approach it from a new angle altogether. If it’s important to us to succeed, we will do anything we can to make it happen. Failure is simply an opportunity to begin again. This time, more intelligently. Ford’s words are so accurate. With the knowledge we acquired from our “failure,” we can continue on in a better frame of mind and we also have more chance of success. We can choose to let failure debilitate us or we can keep trying until we’re successful. It may be true that some times we may genuinely choose to let go of whatever dream or goal we were striving for because it just doesn’t suit us like we thought it did. However, if it means anything to us, we will find a way! It’s when the discomfort strikes that one realizes a strong mind is the most powerful weapon of all. We can use this never give up approach in our weight loss and healthy lifestyle journeys as well. It is vital for us not to give up. Sometimes we may need a break but we should never let go of striving for a healthier us. 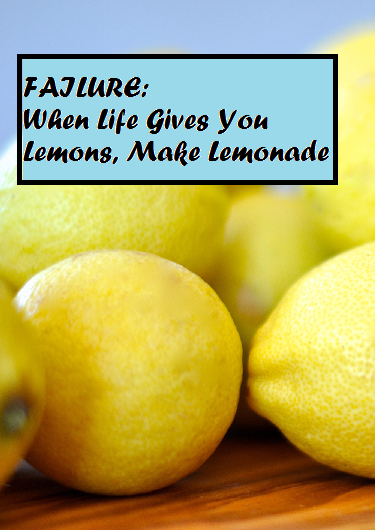 So when we fail, we should view it as something that will actually help propel us forward in our quest. None of us are afraid to admit it, weight loss is hard and we are afraid we might not succeed! It’s natural to take the hit of failure and want to curl up in a ball and never move again. It’s truly debilitating in its own right. We can’t let those feelings win. Grieve for that plan that just couldn’t work out, but then move on and use that knowledge to help you move forward. Your health is too important to let go of. 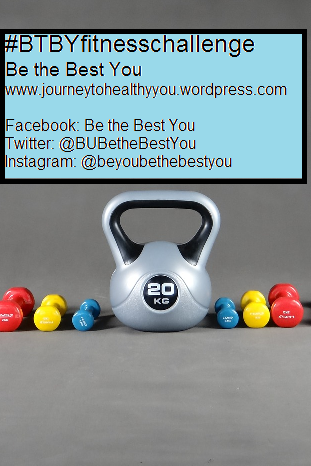 Hey everyone, I’m starting a challenge with you all… Use the tag: #BTBYfitnesschallenge if you want to participate. You can tag on Facebook, Twitter, or Instagram. For the rest of the month we will challenge ourselves to meet our exercise goals. We all have different ones so I’m going to challenge you to create one you can stick with! Set an exercise goal for yourself (public or private) for how many minutes each day, or whatever your goal is for your exercise. Use the hashtag above to post to social media. Tell us whether you met your goal or not, in any shape or form you feel like! You can say exactly what you did such as how many minutes and/or what type of exercise you did. You can also simply say that your goal was met. You can also post pictures or screenshots of your exercise! Sometimes that makes it more fun! (For example, I might personally do screenshots of my Fitbit stats). I will also be posting for my own goals as well as checking in on yours on a regular basis to see how everyone’s doing. Have fun with it. Challenge yourself and push to meet your goals. Feel free to tag my page in your posts as well, but only if you want to. As long as you’re using the hashtag above, we can all see how each other is doing! Remember that you are strong and powerful, and you can conquer your goals! My goals: 7500 steps and 30 min exercise minimum each day except for rest days.